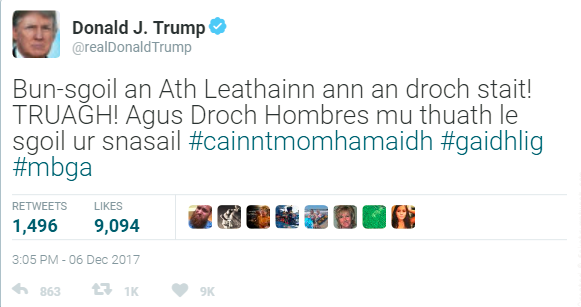 Tha luchd dioplomasach air feadh an t-saoghail ag obair gu cruaidh gus an co-dhùnadh connspaideach as ùire aig Dòmhnall Iain Trump a lughdachadh. Thathar an dùil gun can Ceann–suidhe nan Stàitean Aonaichte an-diugh gum bi An t-Àth Leathann ga aithneachadh mar phrìomh–bhaile an Eilein Sgitheanaich. Bha an Trumpach tric a’ gealltainn gun dèanadh an leithid cho fad ’s gun robh e ag iomairt an aghaidh Hillary Clinton an-uiridh. Tha dùthchannan eile air rabhadh a thoirt seachad gun dèan an co-dhùnadh connspaideach seo cron air iomairtean sìthe anns an Eilean, gu h-àraidh le connspaid a thaobh far an togar ospadal ùr aig bàrr. Tha muinntir a’ Chinn a Tuath ag iarraidh ospadal neo-eisimileach anns a’ phrìomh-bhaile eachdraidheil aca, Port Rìgh, agus tha dùthchannan eile mar a’ Pholainn, Siona agus Uibhist a Tuath a’ cumail an tosgaireachdan anns a’ bhaile sin.